At WO Streaming’s Washington State HQ, we work every day to anticipate the demands of digital broadcasters who care deeply about product quality and listener perception. That’s why we’re always looking for new enhancements to introduce to the WO Streaming digital audio platform—improvements that make it simple and seamless to deliver awesome listening experiences on any device. Today we’re happy to unveil a partnership with longtime industry leaders The Telos Alliance and Modulation Index on a turnkey premium HTTP live streaming (HLS) solution for creating amazing audio experiences. WO Streaming customers now have free access to industry-leading encoding tools that will help you enhance your brand, increase listening session length, and grow ad revenue. Affectionately code-named ‘Icemaker,’ the partnership helps us offer new audio processing capabilities to broadcasters managing their digital audio with WO Streaming. Your audiences may not pinpoint exactly what’s changed, but we guarantee they will feel the difference when content is delivered with precisely normalized tracks and at higher fidelity than ever before. In addition, we’ve put an end to sloppy breaks that can create real or subliminal interruptions to the flow of your streams. Our patent-pending cloud-based media ingest platform improves break accuracy by using artificial intelligence and machine learning techniques to automatically correct misplaced cue points. Best of all, your teams can use this to manage the entire encoding workflow in-house. The bottom line: the ability to offer a superior audio streaming experience that will keep listeners engaged for hours through WideOrbit’s new, free service. For more information on the Telos/StreamS/WideOrbit encoding solution or any other digital audio need, please contact us anytime at wostreamingsupport@wideorbit.com or +1.415.675.6775. We’ll be glad to help you migrate to a new platform and decide which encoding software is best for your business. 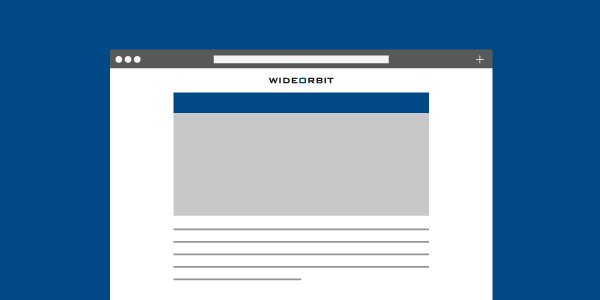 For press inquiries, contact media@wideorbit.com.